The number of Monarch butterflies that reached wintering grounds in Mexico has rebounded 69 percent from last year's lowest-on-record levels. But their numbers remain very low, according to the World Wildlife Fund. Last year, the Monarchs covered only 1.65 acres. It was the smallest area since record-keeping began in 1993. This year, the butterflies rebounded to cover 2.79 acres. That's according to a formal census. It was taken by Mexican environmental authorities and scientists. The orange-and-black butterflies are suffering from loss of milkweed habitat in the United States, illegal logging in Mexico and climate change. Each year, the butterflies make a migration from Canada to Mexico. They find the same pine and fir forests to spend the winter. What's amazing is that they find their way, though no butterfly lives to make the round trip. "Of course it is good news that the forest area occupied by Monarchs this season increased," said Omar Vidal. He is head of the World Wildlife Fund in Mexico. "But let's be crystal clear. It is still the second-smallest forest surface occupied by this butterfly in 22 years of monitoring." At their peak in 1996, the Monarchs covered more than 44.5 acres. The butterflies' destination is the mountains west of Mexico City. Lincoln Brower is a leading entomologist at Sweet Briar College in Virginia. He has said that with anything below 4.1 acres, the butterflies "will remain in the danger category and I will continue to be concerned." He said a population covering 9 to 12 acres would be a sign of significant recovery. The butterfly population has plummeted before, and then partially recovered. In 2001, driving rain and bitter cold killed millions. Scientists speculated that migrating populations would be seriously depleted in 2002. To their surprise, twice as many returned as some had predicted. In 2004, unfavorable weather, pollution and deforestation caused a drastic decline in the population. But the next year, the butterflies bounced back. The overall tendency since 1993 points to a steep, progressive decline. Each time the Monarchs rebound, they do so at lower levels. The species is found in many countries and is not in danger of extinction, but experts fear the migration could be disrupted if very few butterflies make the trip. The temperate climate of the mountains west of Mexico City normally creates an ideal setting for the Monarchs. Every fall, tens of millions of the delicate creatures fly thousands of miles to their ancestral breeding grounds. The movement creates clouds of butterflies. They clump together on trees. This forms chandelier shapes of orange and black. The migration is an inherited trait. No butterfly lives to make the full round trip. It is unclear how they find the route back to the same patch of forest each year. Some scientists suggest the butterflies may release chemicals marking the migratory path and fear that if their numbers fall too low, the chemical traces will not be strong enough for others to follow. Extreme cold and drought also hurt butterfly populations. In Mexico, illegal logging can also punch holes in the forest canopy that shelters them. It creates a situation in which cold rainfall could kill millions. Vidal said Mexico has been able to essentially stop illegal logging in the Monarch protected reserve. But he said habitat loss in the United States remains a huge problem. Milkweed, the butterflies' main source of food, has been crowded out by pesticide-resistant crops. Critical thinking challenge: Name four factors that have a negative impact on butterfly populations. Monarch butterflies are an end argued species do to illegal logging in Mexico and loss of milkweed in America. They were at an all time low taking up only around an acre and a half in Mexico last year but now they are making a come back. They are now, according to a Mexican census, taking up 2 acres. I am really glad that these butterflies have rebounded. 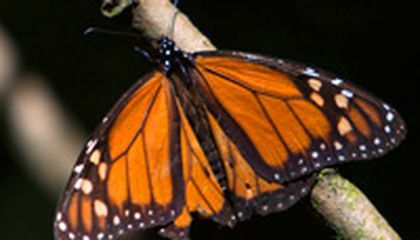 The monarch butterfly population is down. The butterflies are getting killed more From different pesticides. The milkweed decline is causing butterflies to also decline. Scientists measure the amount of bitterflies in a mountain in Mexico. Now there are 2.79 acres that the butterflies cover. It used to be near 40 in the late 90's. I think that the world needs to come together and try to save the butterfly population. We should stop using the killer pesticides and limit our pollution. It is obviously important to save the butterflies, so I am wondering what could we do to prevent such a huge decrease of the butterflies each year? I am wondering is there something that people can do to help the Monarch Butterflies, besides not cut down trees in the butterflies' habitat. I am also wondering if scientists could create a pesticide that would not destroy the milkweed. Wow this is really hard for these butterflies. They lost their milkweed habits. I thought milkweed was their food and the plants that keep them living on the earth. Good luck to those butterflies! 4 factors that have a negative impact on butterfly population are driving rain and bitter cold, pollution and deforestation, droughts, and illegal logging in the butterflies habitat. 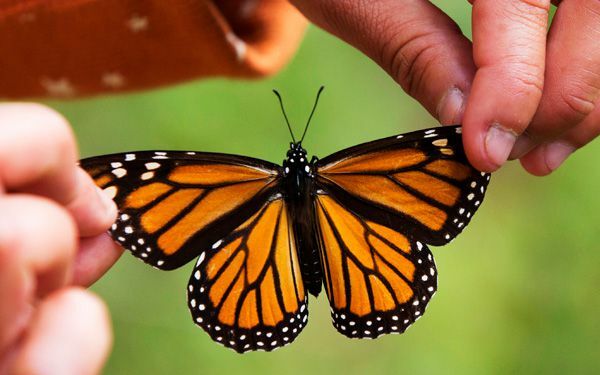 Monarch butterflies are very beautiful and to think that there are enough to cover a few acres of land in Mexico. They are also in the danger category which mean they might extinct some time soon...This is sad. Hopefully the butterflies wont die away too quickly. Extreme cold and drought also hurt butterfly populations in mexico. It creates a situation in which cold rainfall could kill millions.In 2001 ,driving rain and bitter cold killed millions.Scientist speculate that migration populations would be seriously depleted in 2002.To their surprise,twice as many returned as some has predicted. I hope that the butterflies continue to cover more and more ground as the years go on. I have always loved watching these beautiful butterflies migrate over the summer and I would be happy to see more and more of them.